Lenore Tawney, the 20th century pioneer in weaving, died in New York City on September 28, 2007 at age 100. 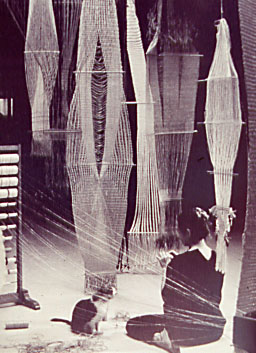 One of the first artists to use fiber as her medium, her innovative use of scale and weaving techniques bridged the gap between craft and art. Although Lenore Tawney was not as recognized as other fiber artists such as Sheila Hicks, her sculptural works have been collected by major museums such as the Metropolitan Museum of Art and the Cooper-Hewitt, National Design Museum. The New York Times has a moving tribute to this wonderful artist.